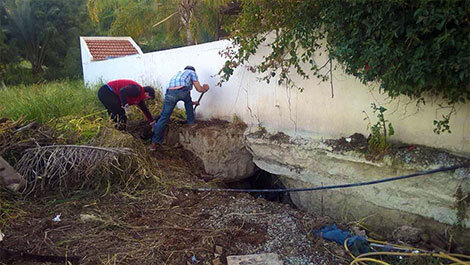 OWNERS of crumbling properties in the Limnes area of Pissouri and their lawyer have said they are bewildered as to why a senior government official is finally visiting them, but only after dark and without inspecting their severely damaged homes. Demitris Syllouris, president of the House of Representatives, will visit Pissouri on Tuesday, January 29 at 6pm, and will hold a meeting at the local coffee shop, according to local homeowners. Many properties, both houses and apartments, have been split apart, or have bowed walls and collapsed roofs. Gardens and pools have been destroyed. Roads have buckled and fissures in the land continue to appear all over the area. Four families have had to be evicted from their homes. At issue is the responsibility for the destruction and therefore the cost. Homeowners insist that the developers, of which there were a number, are not at fault and that the problems are due to land slippage, which is a natural disaster and should be declared as such. By law, the government would then have to help the affected people. Despite promises over the years, the authorities have done nothing. “We are all rather stunned that Mr Syllouris is not coming in daylight to see all of the problems for himself. It has got an awful lot worse in just two days,” said Peter Field who had to abandon his house along with his wife Kayt. A buckled pathway that has only appeared recently as more houses become affected by the land slippage. “It’s getting worse every day, it’s horrific,” Kayt told the Sunday Mail. Her husband added that although the affected residents are pleased at the prospect of Syllouris’ visit, they hope he will return in daylight in order to comprehend the magnitude of the destruction. Syllouris confirmed to the Sunday Mail that he would be visiting Pissouri for what he described as a “preliminary meeting to see what they want”. “I am visiting Pissouri at the request of some of the MPs. This is not my area. If I can help I will,” he said but would not comment on the timing or extent of his visit. Elina Zoi, the lawyer for the Fields and a number of other owners including Aristo developers, told the Sunday Mail that the entire point of requesting MPs to come to Pissouri was so that they could understand first-hand the seriousness of the situation, not to sit in a coffee shop and discuss the issue. She warned that the longer the government delayed in taking action the more money it would have to pay out eventually. In 2015, some of the property owners formed the Pissouri Housing Initiative Group (PHIG). PHIG has paid out thousands of euros for studies and papers from various renowned international experts and satellite imaging, at a cost of 25,000 euros, which measures the movement of the land. According to the study, the movement is up to 40 cm per year, which is a huge amount when pressing against a house. Field noted that there are different types of landslide and the one in Pissouri is a slow one. “In the last few days more problems have occurred, for example a number of houses and flats opposite us didn’t have any visible problems and now there is a 6-inch gap in the wall today,” he said. Another house close by now has a 3 ft high gap at one end of the driveway and it’s worsening daily. According to Zoi, one affected local family has already moved back to the UK. Zoi described the area as an active landslide which is accelerating. Apart from a handful of officials including Green Party MP, George Perdikis, Giorgos Georgiou of Akel and Yiogos Lillikas of the Citizens Alliance, few have taken up on the invitation. The British high Commissioner to Cyprus, Stephen Lillie, recently visited the site and said that the problems at the Limnes development have been well known for many years. He said that the High Commission had raised the issue with the Cypriot authorities in the past and will continue to do so. Zoi said that the situation had to be resolved eventually. “I feel very responsible for these people. It’s not just a professional relationship, it’s very personal,” she said. Limness, is a Greek word translates to “lake” in English. It’s very well known in the community that many years ago the lake contained water and has need dried for many years, no planning officer in their rite mind will issue a building permit for construction of property. I blame the planning office and as such I believe the government is at fault. After dark; let’s hope he takes a torch or he might end-up falling down a large crack…. Homes in the Sun on TV just been trying to sell British couple a home in that village, hope they didn’t buy. Ed: It isn’t all of Pissouri that’s been affected by the landslide – it’s the Limnes area.